Remember when Division 1B teams were at “a huge disadvantage” (John Allen, in case you are afraid of being Rickrolled) compared to those playing in Division 1A? A clean sweep of 1A wins in the 2014 quarter-finals followed by Waterford’s sole win over Galway in 2015, a result so awful for the Tribesman that it effectively left Anthony Cunningham needing to win the All-Ireland to survive it, confirmed the trend. A trend we can now confirm to be nonsense. I’m no statistician, but I know enough to see a sample of eight doesn’t tell us much. A year on and the record is now 9-3, with Clare and Limerick toppling their respective opponents from Division 1A, the latter doing it away from home. Oh, and Waterford went perilously close to crashing out at the hands of a team who needed a couple of injury time scores to squeak past Laois and whose manager is the subject of the usual whispering campaign. I have no doubt that everyone took inspiration from our Triple Crown of wins last season. ‘If Waterford can do it, so can we’ is not a compliment. The Wexford People had an article during the week laden with all manner of sneaking-suspicion stuff that they were about to pull the rug from under us. I have a sneaking suspicion of my own that they would not have dared publish such an article had it been any of the other top-order teams they had been playing. And we should be concerned that they were almost right. What is a compliment to the team and the management is that the overwhelming feeling from yesterday’s result was relief rather than delight. Winning a League quarter-final is no longer like winning the All-Ireland (© every snide hurler-on-the-ditch) but a matter of routine. Let’s hope that two iffy performances in a row by the A-Team is not a matter of routine as well. This entry was posted in Hurling, National League, Waterford and tagged Wexford on 04/04/2016 by deiseach. This entry was posted in Hurling, Media Reports, National League, Waterford and tagged Wexford on 04/04/2016 by deiseach. It can get much worse too. Again, you’ll probably have people saying that Division 1B isn’t so bad, that we could regroup and notch up a few victories a year against weaker teams, and I think it’s fair to say that, in itself, life in Division 1B isn’t that bad. There are enough decent teams in there that it isn’t the dropdown that falling into an eight-team second division might be, and it might be nice to freshen up the array of teams that we play each year after several years of painting-the-Forth-Bridge efforts against the likes of Kilkenny and Tipperary. There’s a potential pincer movement at work here though. After several near misses you can imagine Limerick would be well up for showing us who was boss, Wexford seemed to have bottomed out, Laois are definitely on the way up . . . in fact, they’d all see us as vulnerable. There probably wouldn’t be any 20-point massacre, but we can forget about a quick return to the top table. Yes, I was rather pessimistic about our prospects in Division 1B, and all that was posted before the draw left us with three away games against the the three best opponents. The thing is, pessimism was the appropriate stance at the start. The task set before anyone in such a small division is to not make a single mistake. One slip and you can forget about promotion, and for all the reasons outlined above there were plenty of banana skins. Yet here we are, having successfully negotiated all those banana skins. No doubt we’ll have some downplaying of this, with a few pointing out that the team that got relegated in each of the last two seasons came straight back up. While true, that doesn’t tell us anything of consequence. Dublin did indeed get promoted in 2013, but that was despite finishing second in the division behind Limerick, who they then beat in the divisional final. Would we relish the prospect of taking on Limerick again? This should knock on the head any suggestion that the relegated team has some kind in-built structural advantage over the teams that have been in the division for a few years. And when Cork got relegated in 2013, you can be certain there were groans among the incumbents in 1B, especially when Cork came within a whisker of winning the All-Ireland. Waterford, on the other hand, would have had them rubbing their hands with glee. The team who were occupying their place in the top flight were finally having to vacate it and would indeed be shown who was boss! How satisfying it is to construct that strawman and see it get well and truly torched. Ouch. All of those games would have been at neutral venues and they also reflect Galway’s higher level of preparedness for the League given they would not get to the Championship until August, although why we would have chosen to treat the League with disdain over the years . . . no such excuses this time around. This entry was posted in Hurling, National League, Waterford and tagged Wexford on 23/03/2015 by deiseach. I’ve seen this play before. A traditional hurling county, after a long period of underachievement, suddenly (to those not reading the signs) hits their stride. A raw young team engages in series of matches where they repeatedly dominate their opponents only to repeatedly struggle to put said opponents away. They thrill the neutral and energise their own county, so long used to mediocrity or worse. Yep, Wexford 2014 are comparable to Waterford 1998. Where that leaves Waterford 2015 remains to be seen. As a long-standing advocate of the back door, this game typified what is best about the system. It gives counties who rarely get the chance to play each other an opportunity to do so in a venue appropriate to the occasion. It was a real pleasure to see the stand full to the rafters at Nowlan Park. Such pleasure quickly evaporated when it became clear that the Wexford faithful outnumbered us by a factor of probably 3:1. A cynic might question the use of ‘faithful’ there as there can’t have been many of these people present this time last year in Thurles when each Wexford score when they ran Clare to extra-time – another play I’ve seen somewhere else – last year was greeted with barely a ripple. You might think that. I, on the other hand, couldn’t possibly comment. The early exchanges didn’t suggest that the Wexford support had called this one right as points were quickly exchanged between Shane Walsh and Podge Doran. What they did suggest was the Waterford support who had thrown their hat at it in exasperation at the tactics being employed by Derek McGrath and co were justified as the short puckouts that were such a blight on the midweek game against the Cork Under-21’s were quickly in evidence and quickly causing grief as Wexford pounced on the looseness for Paul Morris to slot over. A cheap free won from a sideline ball allowed Pauric Mahony to level matters but Wexford, while occasionally guilty of over-elaboration, were getting possession and over-elaboration isn’t so bad when it leads to a score as it did for a fine effort by Conor McDonald. Waterford were already having to shoot on sight to compensate for the all-too-frustrating lack of bodies in the full-forward line, Austin Gleeson slashing aimlessly at one effort from distance while Mahony was unlucky to see an even longer effort also go wide. Not that Wexford were immune to poor shooting. History tells us that it’s a curse down there, and it was well punished by Waterford as Jake Dillon did land one from distance. Wexford worked another point for McDonald and then had all the time in the world to put Paul Morris in the clear for simple tap-In goal. It was sign of the alarm in the Waterford ranks that when Colin Dunford’s great solo run ended in him being hauled down for a penalty, there was never any question that Waterford should go for anything other than goal. We were surely going to need it. Gleeson’s effort was poor, visible even from the other end of the ground, and it felt like a good result that it was knocked out for a 65 which Mahony duly converted. Not long afterwards Shane Walsh was called ashore. Given the litany of injuries he has had, one wonders whether we have seen the last of him, which added another downbeat layer to our papier-maché model of misery. 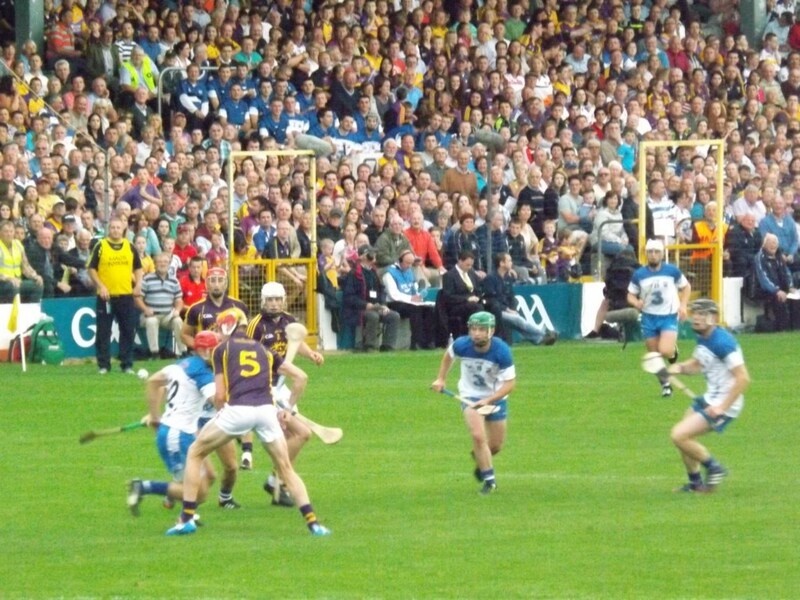 While Wexford were cocky – their fans around us seemed so, at least – and Waterford’s negativity was given our support gas, the game had yet to ignite. If Wexford couldn’t ram home their advantage then Waterford still had a chance. There was a glimmer of a chance on the break for Waterford which led to a Wexford back committing a professional foul rather than let anything in and Mahony was able to reduce the gap. Then Liam Lawlor went on a fine run but his pass to Jake Dillon asked way too much of him and Wexford were able to clear. The next Wexford attack was immensely frustrating for Waterford, repeatedly spurning chances to clear and Wexford were eventually able to score and keep the goal lead. It was only at this point that the penny dropped with me that Michael Walsh was playing in the midfield and Kevin Moran at centre-back. There’s me complaining all year about dodgy line-ups and then I miss a move like this. What was it in aid of? It wasn’t wrong in the style of playing Walsh at full-back in the 2011 Munster final, but it didn’t add to the team, akin to swapping your bishops before a chess game. It could have been either player who teed up Mahony with a super break, and it could have been any one of the Waterford forwards who shot weakly wide. 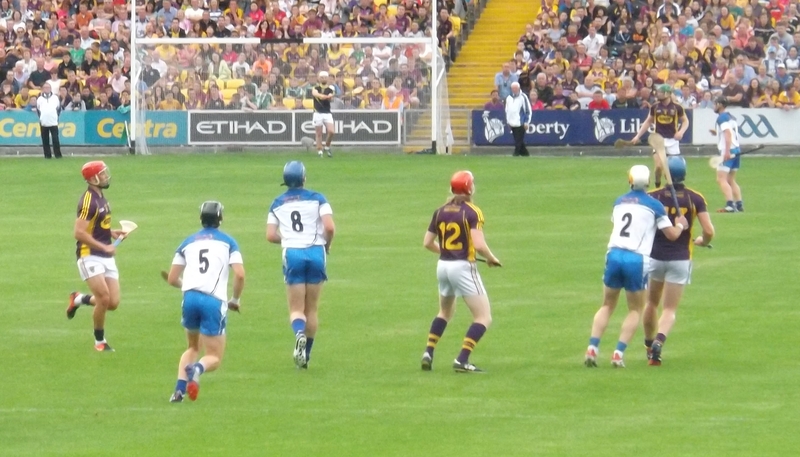 It did indicate a way out for Waterford though – stop shooting from distance, start having the backs and midfield get forward and squeezing the Wexford backs who were having it so easy up to this point. Getting more in their faces allowed Gleeson to pounce on a loose ball to cut the gap to one, then he benefited from a run from deep by Shane Fives to slot over another score to level matters. It required a lot of the backs, something that would be significant later, but for the moment it was an amazingly quick turnaround, especially when a Mahony free left Waterford ahead, almost completely against the run of the play in the first half hour. A stunning long-range shot from Dillon showed Waterford were now on top. This is probably unfair on the management, but it looked as if it were the players, particularly Walsh and Moran, who had wrought this change, talent reacting to changing circumstances. Wexford got one back but Walsh and Moran immediately combined to release Gleeson for another score. You could see Waterford tails were now up, Noel Connors making life miserable for Liam Óg McGovern and forcing him to hit a poor wide. The capacity for self-destruction was still there though for Waterford. The ref picked up on a jersey tug when it seemed like Wexford were going nowhere, and Waterford literally put most of the team back on the line for the free so Wexford were happy to take the point. That was as nothing compared to those goddamn bloody insane maddening short puckouts, and Waterford were once again caught out to allow Wexford to level matters. Then again, what was the point of hitting the ball long when Gleeson, upon winning the puckout, had to go backwards to the corner-back? There’s only so many times you can drive forward like Waterford were doing and right at the end of the first half, disaster struck. I was convinced that Lawlor had his hurley tugged as he approached the dropping ball. Whether it was that or a moment of lost concentration, Wexford were right in around the back and Conor McDonald could score with ease. Now it was Wexford’s turn to have their tails up, and we had reason to be grateful for a couple of shocking wides that there was just a goal in it at half-time. We had had our moments, but could we get goals? There were hopeful signs in the early exchanges in the second half, Matthew O’Hanlon brilliantly cutting out a long pass in the first attack and Dillon hesitating when he had a small opening and was blocked by several defenders who managed to get back. Wexford showed no such hesitation at the other end as Doran lashed a puckout straight over the bar, then David Redmond galloped down the middle of the field unopposed to drill home Wexford’s third goal. What a shambles. Surely the benefit of being negative is that you don’t have to worry about being sliced up like that? I was seriously worried at this stage that this was going to be a complete bust, and had Wexford scored with their next effort on goal it might well have done, but O’Keeffe somehow flung himself to his left to keep out the goalbound effort. Two changes immediately after a poor Mahony wide from a free, including the obvious arrival of Seamus Prendergast, showed the sense of desperation. It had the desired effect though. Mahony got one from a free and then Waterford managed to get that elusive goal. It was a cracking piece of play from Kevin MoRAN, as the presenter on Sky Sports News would refer to him, playing a pinpoint ball across to Dunford to score. Seamus teed up Gleeson to trim the gap to two, and after Wexford hit a 65 Dunford really gave them a right kick in the crotch, emerging with the ball after a magnificent pileup in the square and unbelievably we were ahead. What an effort, but that was the thing – the effort. Are Waterford not prepared properly, or are they not good enough to the extent that they had to burn through 70 minutes of energy to keep in touch after 50? Wexford reacted quickly with two points to regain the lead, the first of the efforts a goalbound effort that was deflected over for a goal. Dunford kept up the good fight by drawing a foul, but Mahony could only send another free wide. At the other end Noel Connors was left exposed and had to give away a foul. This drew a yellow card from the ref and rather crass cheers from the Wexford fans. Anything I say about the Wexford fans will be dismissed as sour grapes, and that’s the reader’s prerogative. The huge Wexford crowd was part of the story here though, so I think I’m entitled to some latitude. There sure is something to be said for the wisdom of crowds, and the size of the Wexford one told us that they could see something was a-brewing with this team, which is great after so many years in the doldrums. Still, did they have to bring everyone in the county who had never attended a GAA match? It seemed like every wide was greeted with a big cheer, a breach of rule number one: don’t celebrate the score until you see the green/white flag. Was I imagining all this? Possibly, although the loon who had been necking a bottle of Jägermeister throughout the game picked up on it too, yelling “YEESS!” at a particularly inappropriate time to chuckles from everyone around. He did it again moments later. There were no laughs. Tough crowd. Such blather prevents me from facing up to the reality. It was a one score game, but Waterford were shot. Wexford stretched the lead to three when a sniff of a chance was pounced on by corner-back Liam Ryan who roared down the field to set up the point and lift every yellow belly in the ground, veteran and ingénue alike. Stephen Molumphy showed the benefit of fresh legs with a flying score, but it was going to take something improbable to save us. Stephen Bennett certainly fits into the subset of those capable of the improbable and he came on just as he had in the Under-21 game, so much pressure on such young shoulders. A little luck also helps, as the ref played a ridiculous advantage when Wexford would probably have looked for the free and the ‘advantage’ ended up hitting the outside of the post. We were going to need oodles of it, and got some more when O’Keeffe stepped past a dropping ball and the defence somehow kept it out. Even more luck came in the form of some abysmal Wexford shooting. The game had completely broken down at this stage and it meant that there was a slim chance we could pick their pocket. Molumphy and Bennett each had half-chances but Wexford managed to close them down and force the wide. As the game ticked into the last couple of minutes Bennett had better than half a chance, but Ryan was there again to block and clear. A late chance to drop it in drifted wide and with that they finally got to the finish line with us still clinging to their coattails. Seven minutes into the second half and seven points down, I really feared a pounding like we had endured against Cork. It didn’t happen, and for that we have reason to be relieved. 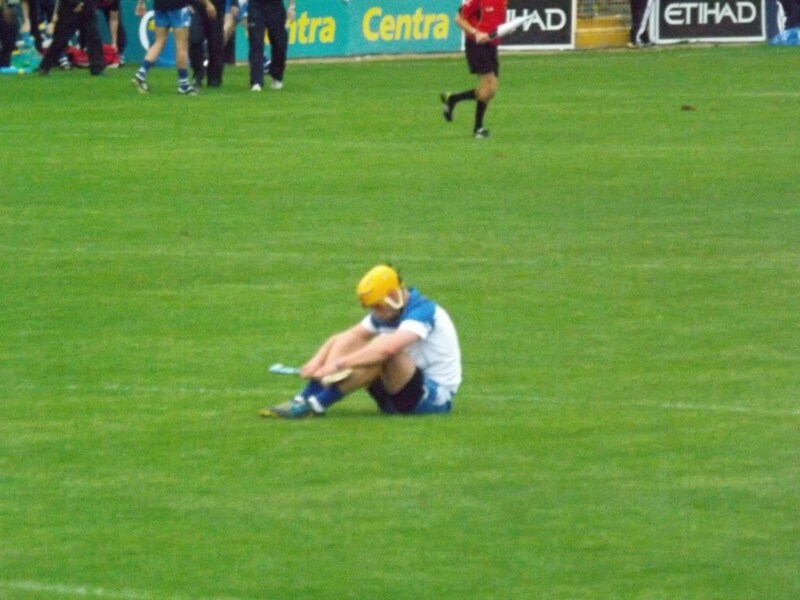 The loss to Cork at Under-21 was far more grievous. And while I couldn’t help having a wry cut at Wexford above, it was gratifying to see them enjoying a win over Waterford with such gusto. We ain’t dead yet. We might be soon, but we ain’t dead yet. 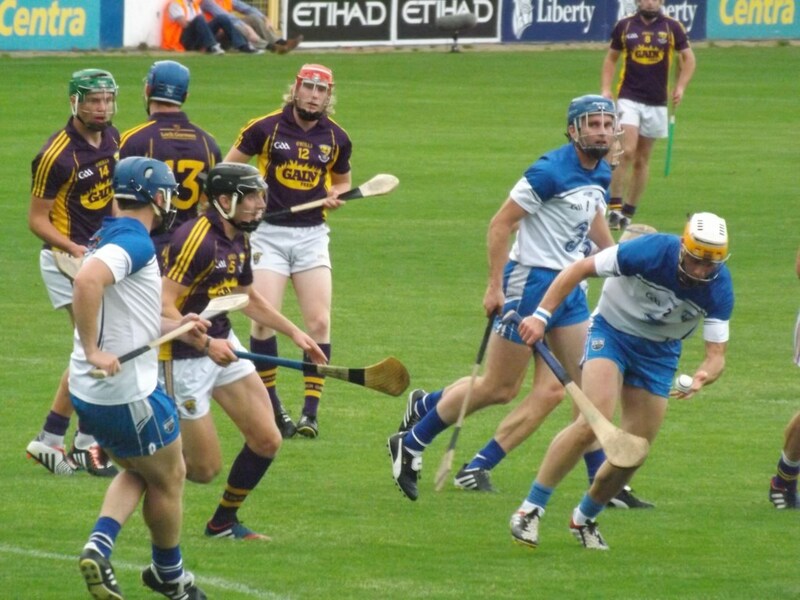 This entry was posted in Hurling, Match Reports, Waterford and tagged Nowlan Park, Wexford on 21/07/2014 by deiseach. 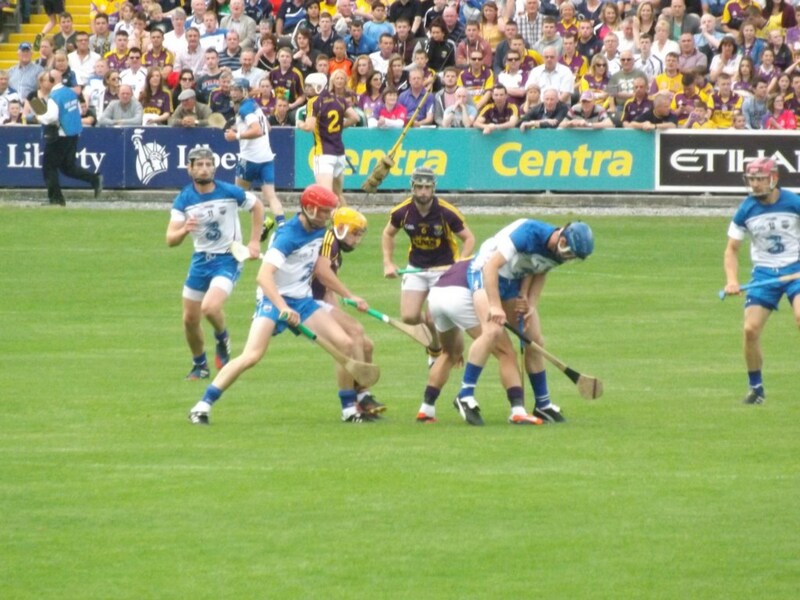 This entry was posted in Hurling, Waterford, Waterford gallery and tagged Nowlan Park, Wexford on 21/07/2014 by deiseach. We put a plan in place similar to other counties, such as Dublin, Waterford and Limerick. If it works for those counties, why not for Wexford? Are you sure, Diarmuid? Maybe he meant Kilkenny and was too bitter to admit it. But then I think of what our Minors accomplished this year, and how even that wasn’t good enough to keep Seán Power in his post when faced with the plan to promote managers in line with the players they have mentored since U-14/Tony Forristal level, and I think that he really does mean Waterford! Thanks for the compliment, but don’t go learning the lessons too well. This entry was posted in Hurling, Waterford and tagged Minor, Wexford on 20/12/2013 by deiseach.